In our previous articles we have looked at what B2B ecommerce is, how B2B eCommerce is different from B2C ecommerce, Features unique to the world of B2B eCommerce and Adoption Challenges with B2B eCommerce. In this article, the last of the series, we will look at things which businesses must do to overcome the challenges mentioned in the previous article. Businesses, that wish to successfully adopt B2B eCommerce, must first and foremost understand and quantify what they want to achieve and how will it help the organization. Because lack of a clear end goal will give everyone involved an opportunity to define their own goal and objectives, which can then take the project in completely different directions; leading to delays and cost overruns. Moreover defining a goal and tying it back to the company’s goals and objective also helps the top management understand and appreciate the importance of the initiative and in turn extend support for successful adoption. Once the goals and objective of the project, adoption of B2B eCommerce, are identified and defined it is imperative for the team driving the initiative to involve all the stakeholders of the project; education helps in managing the expectations of the stakeholders involved. Anyone who gets affected, directly or indirectly, because of the implementation of the B2B eCommerce like IT department, Sales department, top management, supply chain stakeholders, clients, etc. must be involved and educated. It is important to educate all stakeholders about the initiative, the goals and objective, the impact it has on every stakeholder involved, the support that will be provided (like training, issue resolution, etc. ), what is expected of them, and more. This is also a very critical step in addressing channel conflicts which is very common in B2B eCommerce projects. To drive involvement it is imperative to take feedback from the stakeholders involved and device a strategy to address the genuine concerns. Taking feedback and acting on it not only improves the process but also drives participation by giving them a sense of ownership. But this cannot be a onetime process and steps must be taken to do this over and over again throughout the cycle of the project. Usually it is observed that the motivation, participation and the momentum tapers off as the project progresses. Hence, for the successful adoption of the B2B eCommerce, it is critical to keep the motivation going. For successful adoption it is also important for the businesses to have the right infrastructure in place. After identifying the goals and objective business must spend time understanding the critical success factors and then work towards building them. This includes everything from getting the budgets approved, identifying and building the systems and processes, getting the right resources in place, identify and integrating the right systems, etc. This also involves how the concerns raised are addressed; not all concerns raised by the stakeholders can be taken into consideration and hence must be handled effectively. While it is important to educate and take feedback it must also be made clear that politics or hidden motivations cannot and will not be entertained. More specifically for internal channel conflicts, businesses must ensure that they have a good structure and a well define incentive programs (commissions, bonuses, etc.) to motivate channels in ways that do not undercut each other. Training and ongoing support are one of the most cited reasons for failure of successful B2B eCommerce adoption. Some businesses go to the extent of training the internal resources but completely ignore other stake holders like supply chain partners and customers. To be successful business must spend time in identifying the training needs of all the stakeholders involved, both internal and external, and then building a plan to address those training needs. As mentioned earlier, taking feedback is an ongoing process and must be followed not only during the implementation of the project but even after that. The feedback must be taken to identify the pain points of the stakeholders, to identify new features and other things. The feedback collected then must be examined and used to further improve the process. 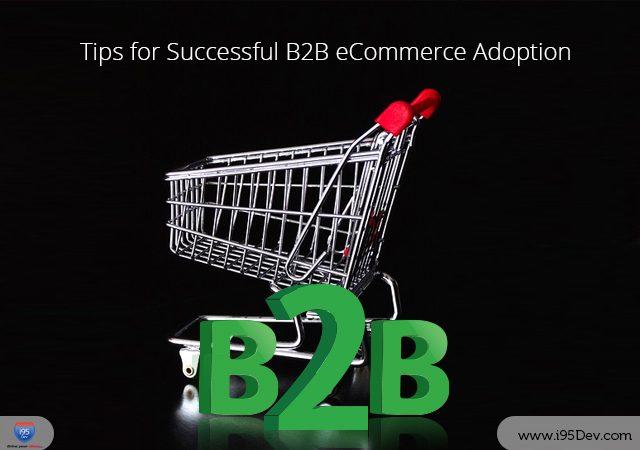 It is important to note that B2B eCommerce adoption cannot be an overnight process and will happen over a period of time. Last but not the least reward all those involved and those who comply to encourage them and to improve participation. In the end it all boils down to this – an effective Change Management Plan; everything that we have discussed above is part of a change management plan and when carried out effectively can do wonders for a business. There are three aspects to it planning for change, managing change, and reinforcing change. With this blog we conclude our series on the world of B2B eCommerce. If you are a B2B business and have questions about how you can leverage the power of B2B eCommerce to drive your sales and business, feel free to contact i95Dev – Partner for your B2B eCommerce Needs.